Lucrative incentives announced upto 100% income tax and Excise duty exemption plus 15% subsidy on investment. Can the Punjab industry survive against such a competition? 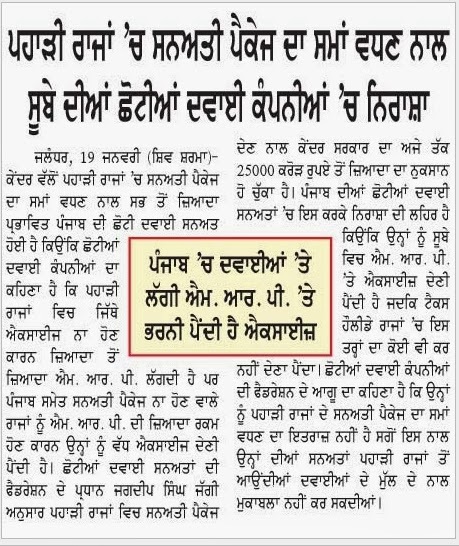 We feel perhaps the Khalistani people are right when they says that Central Govt is inimical to Punjab. 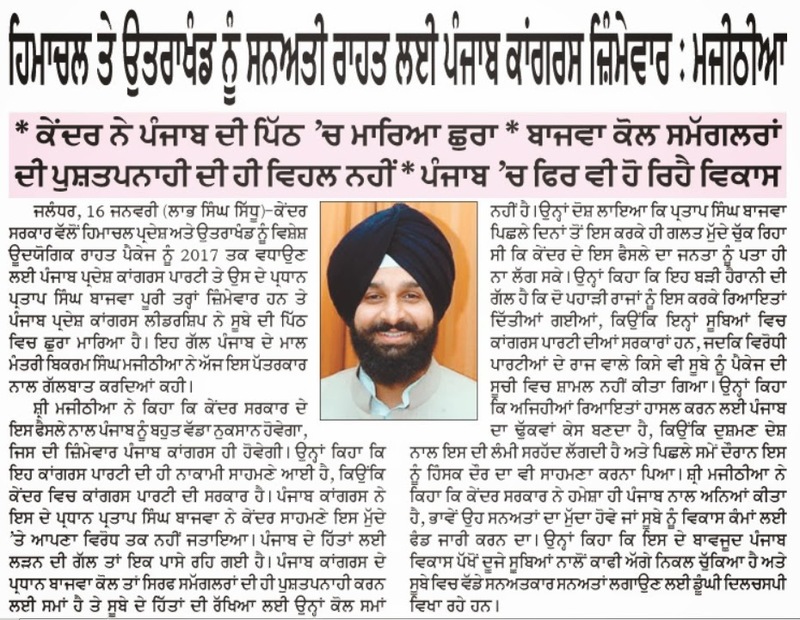 Read the related news items in English and Punjabi. The Cabinet Committee on Economic Affairs (CCEA) today extended the special industrial package for Himachal Pradesh and Uttarakhand till 2017, a move that will boost industrialisation and create more employment in the two hilly states. Both the states have seen phenomenal growth in investment and industrial growth in the last 10 years due to the package. However, the neighbouring states like Punjab have been opposing the extension of the package on the plea that it is driving industry out of the state towards the hilly states because of special incentives. Welcoming the decision to extend the package, Commerce and Industry Minister Anand Sharma said this would generate gainful employment, especially for the rural youth. “It will also give a fillip to manufacturing and the small and medium enterprises in these two states”, he said. A special package for industrial development in both the states was extended by the government in 2003 as these states were lagging in industrial growth. In 2007, it was curtailed, before being restored till 2010. The capital investment subsidy was one of the major components of a special industrial package offered to the states by the union government. The objective of the policy announced in 2003 was to provide the required incentives as well as enabling environment for industrial development, improve availability of capital and increase market access to provide fillip to private investment. Subsidy would be available to units located in notified areas as well as to “thrust industries”. The move reflects the discriminatory attitude of the Centre towards Punjab. Our state has suffered a lot due to militancy, tax concessions to neighbouring states. Subject: New Industrial Policy and other concessions for the state of Uttaranchal and the state of Himachal Pradesh. 2. In pursuance of the above announcement, discussion on Strategy and Action Plan for Development of Industries and generation of employment in the states of Uttranchal and Himachal Pradesh were held with the various related Ministries/agencies on the issue, inter-alia, infrastructure, development, financial concessions and to provide easy market access, The new initiatives would provide the required incentives as well as an enabling environment for industrial development, improve availability of capital and increase market access to provide a fillip to the private investment in the state. (b) 100% income tax exemption for initial period of five years and thereafter 30% for companies and 25% for other than companies for a further period of five years for the entire states of Uttaranchal and Himachal Pradesh from the date of commencement of commercial production. (II) All New industries in the notified location would be eligible for capital investment subsidy @ 15% of their investment in plant & machinery, subject to a ceiling of Rs.30 lakh. The existing units will also be entitled to this subsidy on their substantial expansion, as defined. (III). Thrust Sector Industries as mentioned in Annexure-II are entitled to similar concessions as mentioned in para 3(I) & (II) above in the entire state of Uttranchal and Himachal Pradesh without any area restrictions. (i) The funding pattern under the Growth Centre Scheme currently envisaging a Central assistance of Rs.10 crore per centre is raised to Rs.15 crore per centre. (ii) The financing pattern of Integrated Infrastructure Development Centres (IIDC) between Government of India and SIDBI will change from 2:3 to 4:1, and the GOI funds would be in the nature of a grant, so as to provide the required infrastructural support. (i) Deen dayal Hathkargha Protsahan Yojna and other incentives of Ministry of Textiles: The funding pattern between Government of India and both the States would be changed from 50:50 to 90:10 under this Scheme. Ministry of Textiles would extend its package of incentives, as notified for North-Eastern States, to the states of Uttranchal and Himachal Pradesh also. (ii) Ministry of Food Processing Industries would include Uttaranchal in difficult areas category. The state of Himachal Pradesh is already included in the difficult areas category. (iii) Pradhan Mantri Rozgar Yojana (PMRY) : Ministry of Agro & Rural Industries would provide for states of Himachal Pradesh and Uttranchal relaxation under PMRY with respect to Age (i.e. 18-40 years from 18-35 years) and Subsidy ( @ 15% of the project cost subject to a ceiling of Rs.15,000/- per entrepreneur). The list of industries excluded from the purview of proposed concessions is at Annexure-III. In addition, the Doon Valley Notification (S.O.No. 102(E) dated 1st February, 1989 (Annexure-IV) as amended from time to time, issued by Ministry of Environment & Forests would continue to operate in the Doon Valley area and the industries notified under it are excluded from the proposed concessions, in the state of Uttaranchal. The Nodal Agency for routing the subsidies/incentives under various schemes under this Policy will be notified seperately. 4. Government reserves the right to modify any part of the policy in the interest of public. 5. The Ministry of Finance & Company Affairs (Department of Revenue), Ministry of Agro & Rural Industries, Ministry of Textiles, Ministry of Food Processing Industries, Ministry of Small Scale Industries, etc. are requested to amend Act/rules/notifications, etc. and issue necessary instructions for giving effect to these decisions. Deputy Chief Minister Sukhbir Singh Badal today alleged that the Central Government had always discriminated against Punjab. In a recent case, the Centre had extended industrial package to neighbouring states till 2017, he said. "This is an attempt of the Congress-led UPA government to derail the tempo of development in the state," he said while speaking at the inauguration of Fortis Hospital here. Congress workers from the state approached their high command to protest for party positions, but they never pleaded for an economic package for their own state, he said, adding that PPCC president Partap Singh Bajwa should stage a dharna against the extension of sops to other states. Presiding over a meeting of principal secretaries and deputy commissioners along with Revenue Minister Bikram Majithia and Health Minister Surjeet Kumar Jyani at PAU, Sukhbir said the government would distribute Blue Cards within 10 days starting February 5. 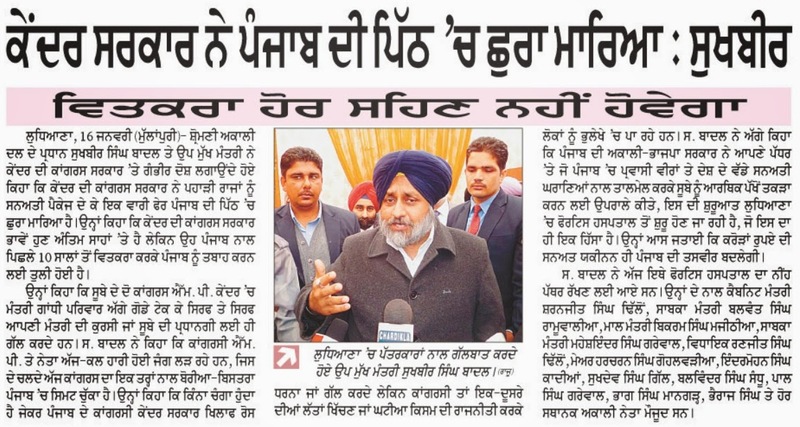 Sukhbir approved a distribution scheme of mineral supplies to be implemented from February 1. Under the scheme, mineral supplies like sand and gravel would be controlled by the Mandi Board to make available the material at affordable rates across the state. The state has finally decided to take a proactive approach for reviving the staggering iron and steel industry. With more than 150 iron and steel units in Mandi Gobindgarh having shut down in the recent past, the state has decided to slash value added tax (VAT) on iron and steel as also the advance tax on the finished goods. The government has decided to cut VAT on iron and steel goods (except CENVAT paid scrap) from 4.50 per cent (plus 10 per cent surcharge) to 2.5 per cent (plus 10 per cent surcharge). It has also decided to reduce advance tax on scrap brought to Punjab from other states from 4.5 per cent to 2.5 per cent in case where CENVAT has been paid and to just 1 per cent (with 10 per cent surcharge) on scrap brought from outside the state (including scrap bought from junk dealers) on which CENVAT has not been paid. Besides helping the staggering iron and steel industry, another reason for reducing VAT is to plug loopholes in its collection, especially in the case of scrap, which forms a major raw material in the industry. Most of its sale goes unaccounted. It is estimated that scrap worth Rs 5,000 crore is sold in the state annually. Official sources told The Tribune that the decision had been taken to give a boost to the industry. In just nine months, between April 1, 2013 and December 25, 2013, the state Industry Department reported that 155 steel units in Mandi Gobindgarh had closed down. These included 55 small, 40 medium and 60 large units. The main reason was shrinking profit margins because of disparity in taxation. This has its wider ramifications as this industry provides raw material to machine parts, tools, bicycle and bicycle parts, auto parts and foundries, among others. 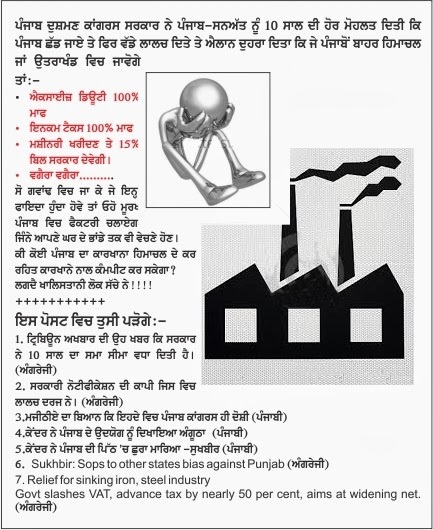 The sources said Punjab got Rs 1,100 crore revenue from the iron and steel industry, of which Rs 400 crore was refund claim. With the new incentives being given, the state would get a revenue of Rs 600 crore and the VAT refund claim was projected at Rs 100 crore. As a result of these incentives, the state would bear a loss of Rs 200 crore each year. All these incentives are to be cleared by the Punjab Cabinet before a formal notification is issued. The government also proposes to link production to power consumption for evaluating VAT. Officials feel that if production is linked to power consumption, it will lead to more VAT generation as production cannot be hidden.